Hanging up in my office is a poster of a teenager. It show this young person in the prime of life, involved in sports, photography, smiling alongside friends and hugging family. I received this poster at their funeral after they tragically decided to take their own life. I didn't know this young person, but I did walk past them often in between places i needed to be. I was on my way to find kids that needed some help, yet I never noticed this one. I know that this event was not my responsibility, but I keep this poster up on my wall to remind myself that this job can sometimes mean the difference between life and death. Just this spring another young person told me that some passing words I made had prevented the attempt they were going to make on their own life. I do wonder what may have been different if... but the what if questions cannot be answered. What I can do is change my future. 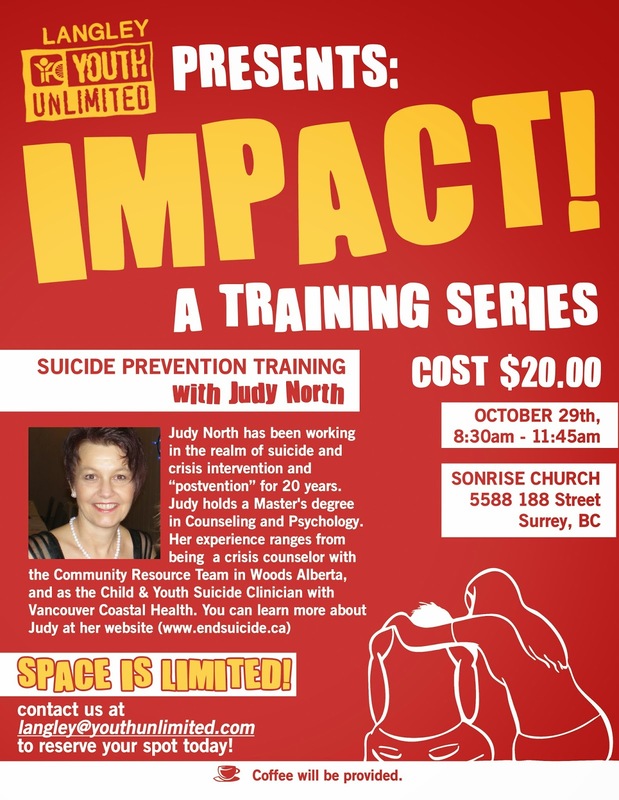 For that reason we at Youth Unlimited in Langley are offering a youth suicide prevention training for counselors, youth workers, parents, volunteers and/or anyone else wanting to brush up on their skills in risk assessment and care for those young people for whom this is an issue. Please check out the poster for all the details.